January 2, 2016 June 22, 2018 • Glenna G.
Note: This post was first published on my original travel blog, back in 2014. After leaving Wellington, we took a ferry over to Picton. 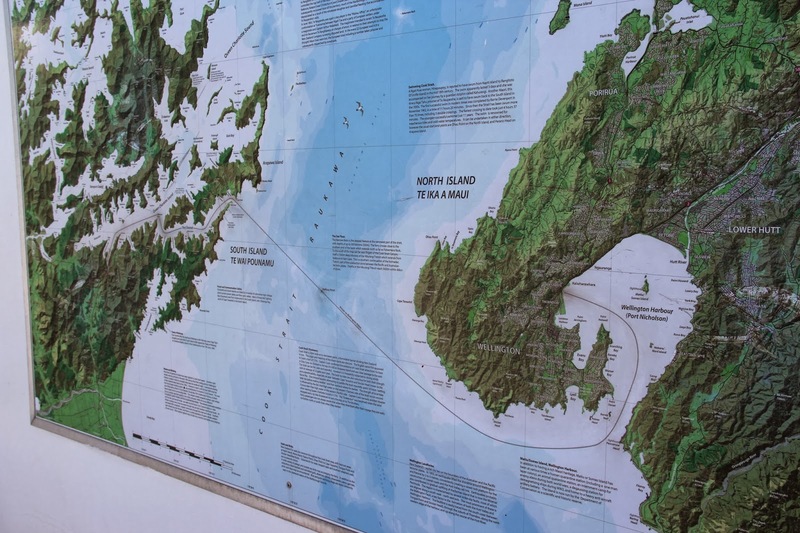 As you can see on the map below, the ferry to the South Island actually goes north. The ferry ride took about 3 1/2 hours, and there were great views of the Marlborough Sound to entertain us along the way. One thing I have to say about the South Island… The weather was so much better. It rained our first week on the North Island, which put quite a damper on our winter escape. Our next stop was Kaiteriteri (Kai-teery-teery). Beautiful spot, although we literally slept in a trailer with bunk beds. NOT my favorite hostel. But the location made up for it. We were right across the street from this beautiful beach! I got up at sunrise to have the beach all to myself. Most people would spend a few days here, but since Ally and I were on a short schedule, we continued on past this beautiful place. I’ll be coming back here for sure! At our next stop, we were in a really cool little hostel with beach vibes. There were small rooms as well as tents (for half the price) set up in the courtyard. We particularly enjoyed the hammock chairs. As soon as we checked in Ally and I signed up for the day’s surfing lesson! As children of the Midwest, we’d never had the opportunity to go surfing before. It was AWESOME! Gorgeous day, and I got some really cool footage with my GoPro (of me catching a few waves and then a few epic wipeouts). I actually did really well for my first time – now I just have to figure out how to steer. After we got back to the hostel and cleaned up a bit, we got fish n’chips from a small cafe and hopped back on the bus for a short trip to another beach! This one was covered in driftwood, so it was perfect for a bonfire. The boys played soccer, while the rest of us got the fire started. Ally and I had managed to find a few special ingredients at the grocery store, and we taught some of our new British friends how to make s’mores! We could only find giant pink marshmallows and non-Hershey chocolate, but they got the idea. The next day we headed farther down the West Coast, renowned for its stunning vistas. We were not disappointed. We stopped at Punakaiki, which features the Pancake Rocks. The rainbow you can see below is created by the spray from the ocean, coming up through a blowhole each time the waves surge high enough. We stopped in Franz Joseph, home of the Franz Joseph and Fox Glaciers. We hiked for a few hours, to go see the glacier up close. Or at least, we thought we’d get to see it up close. The glacier has actually shrunk quite a bit in the past few years, so we couldn’t get close at all. People are flown up by helicopter to go hiking on the glacier. You used to be able to climb up to the top, but I guess some people died, so they stopped letting you get up that way. The next day we stopped at Mirror Lake, so named for obvious reasons. Laka Wanaka is gorgeous. The lakes are really this color! From our hostel, Ally and I walked to Puzzling World. I had my doubts, but it was a neat little self-described “World of Weirdness”. Inside were illusion rooms, and we did the “Great Maze” in back. They also claim they have New Zealand’s most unusual public toilets, and I have to admit, they were pretty weird. Ally got to re-create her Leaning Tower of Pisa pose! 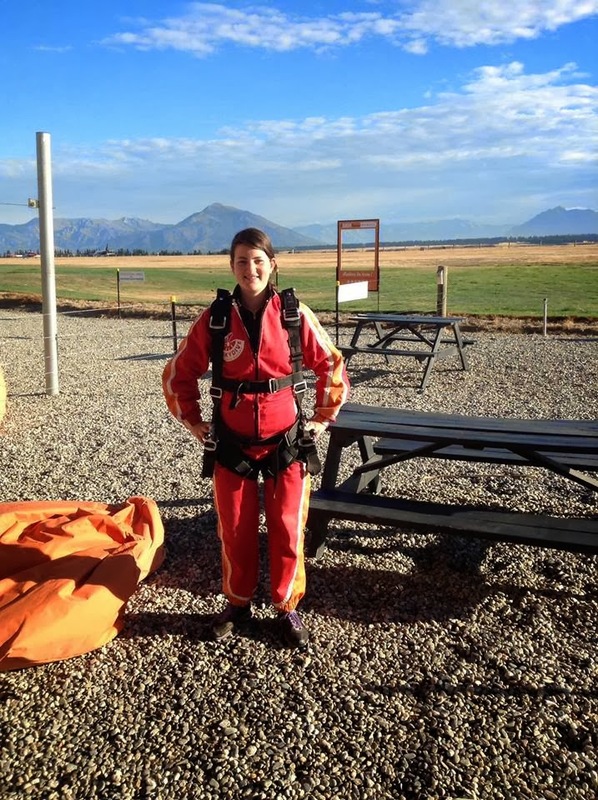 Wanaka was also where we finally went… Skydiving! We had decided that this would be our big splurge for the trip, since neither of us had ever done something so extreme and New Zealand seemed like the place to start! This was our 4th attempt. The weather was bad the previous 3 times we tried to go, but we persisted! We went up in this tiny little plane. 12,000 feet, and there’s nothing like it! What a rush. We stopped at Kawarau Gorge and the Kawaru Bungy Centre on the way to Queenstown so people could go bungee jumping. This is the birthplace of modern bungee jumping! Looks like fun, except for the part at the bottom, where they have to pull you into a raft and detach you… And the whole thing where they harness you in and then make you look down while they wiggle your toes over to the edge. Maybe next time. Skydiving was all we could handle this time around! Queenstown! We stayed for 3 nights, our longest stay in any one place. It was very pretty, but also very touristy. Our hostel was just 2 blocks from the waterfront. Ally and I took a walk around the Botanical Gardens (which have a disc golf course… unusual) and stumbled across some great views. After some souvenir shopping and a HUGE Fergburger (a must-eat in Queenstown), we took a hike guided by a Swedish guy who worked at our hostel. Queenstown has a gondola that goes to the top of the mountain in the city, but it only took us about an hour to hike up to the top. From the observation deck on top, we had a great view of the city and surrounding landscape, paragliders, and a luge (a bit like downhill go-karting). Queenstown was a very pretty little stop, and Ally and I enjoyed settling in for a few days after our mad dash around New Zealand. We got all of our souvenir shopping done, and I mailed a bunch of postcards. We were sad that our time was growing short, and we had to say goodbye to a friend we’d been traveling with for pretty much the whole trip. But hey, that’s how international traveling goes. We’ll see you again someday, our British and Canadian friends! 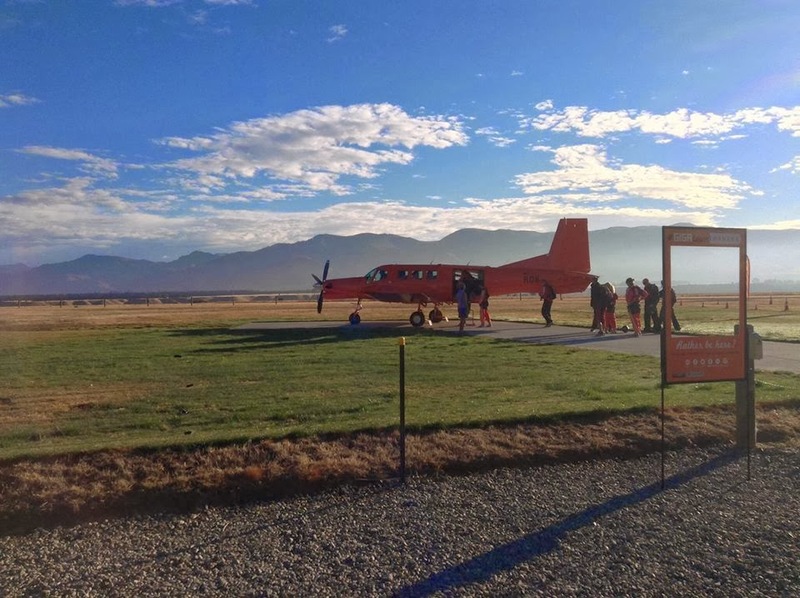 Next post: Tekapo, Christchurch and Sydney! Posted in Outdoors, Travel BlogTagged New Zealand, Travel, Travel BlogBookmark the permalink.